WHILE THE DRAFT Brexit deal caused what can only be described as chaos in Downing Street this week, it also caused consternation in Scotland. 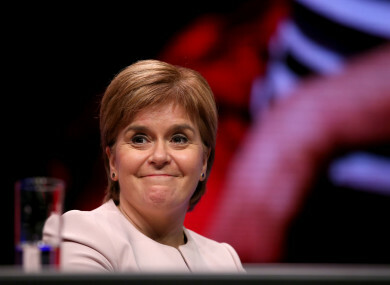 As perhaps is to be expected, the SNP and its leader Nicola Sturgeon have used the deal as the basis to jumpstart moves towards another independence referendum. The party has already committed to another vote on independence but the Brexit uncertainty of recent years has put these efforts somewhat on the backburner. Now that the party has something concrete to point at, it has upped its criticism and is again looking to put the issue on the agenda once more. The big talking point this time is Northern Ireland. As the SNP tweeted on Thursday, Scotland is not specifically mentioned in the draft agreement whereas Northern Ireland is – 100 times. For the party of government in Scotland, that is unacceptable. Scotland voted to remain by 62% to 38%, the clearest result of any of the UK’s four countries. The SNP is arguing for specific Scottish provisions within the draft deal, but at the very least is opposed to Northern Ireland being given a special status that it feels will hinder Scotland economically. It would take Scotland out of the single market, which would be bad enough in and of itself, but it would do so leaving us competing for jobs with Northern Ireland which would effectively be staying in the single market. That would be the worst of all possible worlds for Scotland. Speaking in the Scottish parliament the following day, the Scottish First Minister sought to put the issue of a referendum back front and centre. Sturgeon claimed that the Scottish Parliament has been “sidelined” during Brexit negotiations and that “the case for independence has grown stronger every day”. She even went on to argue that the protection the EU has offered Ireland during Brexit negotiations should act as an example to other independent nations. Including Scotland, you could only assume. “The European Union is a union of independent countries and look how it has stood by and stood up for Ireland over these last two years,” Sturgeon said. But while Sturgeon may be seeking to use the draft Brexit deal to put independence back on the agenda, the overall Brexit issue has had the opposite effect she would want. 15.11.18 The draft Brexit deal is 585 pages long. What's in it and what happens now? Scotland voted by 55-45% to remain in the UK in 2014 but in the years between that referendum and the Brexit vote, support for independence began to creep up again. In fact, three separate polls in Scotland on the week of the Brexit referendum showed a majority in favour of independence. An exit poll that day made it 48-41% in favour of independence with 9% undecided. But the uncertainty since Brexit has turned that completely around. Almost every single poll since has shown Scots do not favour a break from the union in the midst of Brexit uncertainty. The latest poll last month showed a 10 point lead for remaining part of the UK. Sturgeon’s latests efforts may therefore be mistimed, but they are likely designed to ensure that EU membership remains part of any debate on independence. When Scotland rejected independence in 2014, one of the key issues was whether an independent Scotland could join the EU. At the time it was argued by those against independence that leaving the UK would also risk leaving the EU. Sturgeon’s card is now that leaving the UK could be the only way of staying. Email “Indyref 2? The Brexit deal has put Scottish independence on the agenda again”. Feedback on “Indyref 2? The Brexit deal has put Scottish independence on the agenda again”.